» Middle Relief: What to Do With the Twins? You’re the worst team in the American League. You’ve gone from six division titles in nine years to a possible second straight season in the cellar. Your pitching and defense is so bad, you need a telescope to spot the next-worst run prevention team in your league. You have one or two impact prospects in your farm system, but they’re years away from cracking the majors, let alone making a significant impact. You’re Terry Ryan, general manager of the Minnesota Twins. What do you do? What do you do? You make incredibly dated Speed references, because when it comes to rebuilding the Twins, you’re kind of screwed. To understand how bleak the Twins’ near-term future looks, it’s instructive to see how they got here. • As with most teams, a few years of fallow drafts can wreak havoc down the road. 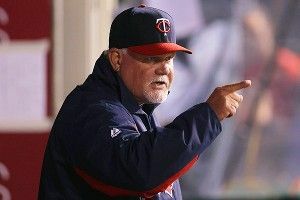 The Twins developed a nasty habit of drafting pitchers with good command and fastballs that can’t dent a piece of bread. Pitching injuries have compounded the problem: 2009 and 2010 top picks Kyle Gibson and Alex Wimmers, both college starters, are both recent Tommy John casualties. Fellow top-50 picks Matt Bashore and Shooter Hunt (two more college starters, of course) have also stumbled with injuries laying waste to a generation of Twins high-draft selections. Meanwhile, 2008 top pick Aaron Hicks has seen his development stall over the past year-plus, posting a mediocre .720 OPS in High-A ball last year, getting promoted to Double-A anyway, and faring no better this year. haven’t been so fresh. The most notorious whiff came after the 2007 season, when Minnesota dealt Johan Santana for four prospects. That in itself isn’t a problem: The Rangers traded Mark Teixeira six months earlier for five prospects, and used that deal to help build the nucleus of a two-time (and counting?) pennant winner. Unfortunately, Minnesota got Carlos Gomez, Deolis Guerra, Kevin Mulvey, and Philip Humber for Santana, who was one of the four or five most highly regarded pitchers on Earth at that time. • Trading a perfectly capable, young, everyday catcher candidate in Wilson Ramos for pedestrian reliever Matt Capps was another great idea, because when you have two good catchers you have to sell one for Savezzzz or something. Dumping J.J. Hardy for nothing and signing Tsuyoshi Nishioka have been awful mistakes, too. Twin last year, on the rare occasion when he stayed healthy enough to play. Meanwhile, Joe Mauer has returned to his .400 OBP ways, but his persistent leg injuries have raised questions about a position switch and other undesirable outcomes. Problem is, Morneau still has most of this year and all of next year left at $13 million per, while Mauer’s just a year and change into a $184 million contract that looks awful because of the injuries, and also because Mauer’s 28 homers in 2009 now look like a big, fat mirage. • Francisco Liriano might be the most frustrating player in the history of baseball. He’s shown flashes of Cy Young–level performance, but spends most of his time alternating an intense aversion to the strike zone with more meatballs than a Lady and the Tramp marathon. If you picked him up in fantasy after he shut out the A’s for six innings Wednesday, please head straight for your nearest mental institution. something they’ve rarely to never shown an impulse to do anyway. The Twins do have a few factors working in their favor: They’ll pick second overall in the upcoming amateur draft, and figure to land another top-five choice next year if their terrible play continues. They’ve got a new ballpark that’s still got enough sheen to goose attendance a bit (though the Twins have seen a bigger drop in attendance this year than any other club). And they do play in the AL Central, which will continue to not be the AL East for the foreseeable future. But between the long haul of getting top draft picks to the big leagues and the far-away nature of their current top prospects, the Twins might not be good again until long after Morneau’s gone and Mauer’s past his prime. that Brian Dozier can be a quality major league shortstop, that Ben Revere can parlay his high contact rates and excellent speed into legitimate offense, that Trevor Plouffe and Scott Diamond and all the rest of the Twins’ young players can pan out better than their relatively modest pedigrees would suggest. If they don’t, the most logical course of action might be to shop the M&M boys and hope to speed up the rebuilding process. Of course, Joe Mauer’s not going anywhere anytime soon, not even with every objective measure in the world pointing against paying him $184 million for what he has left. But whatever they do, it might have to be something drastic. Because right now, there might be no team further away from success than the Minnesota Twins. Dayán Viciedo: Three more hits for the White Sox left fielder Wednesday made him 16-for-29 in his past seven games, with four homers, 10 runs scored, and 13 driven in. The book on Viciedo has always been simple: swings for the moon, no intention of walking off the island. The Cuban slugger has made that approach work this season, with a .291/.312/.515 line, 35 strikeouts against just four walks (only Starlin Castro has a lower walk rate than Viciedo’s 2.4 percent), and a 35-home run pace. The kicker here is what a big season for Viciedo could mean for the White Sox. In recent years they’ve had a reputation for being old and slow, a team that either hits three-run homers or fizzles out. They can still mash (sixth in MLB in homers), to be sure. But this Sox team runs more than its recent predecessors, and is just a tick older than league-average. While 36-year-old Paul Konerko is still the team’s best player and homegrown prospects like Gordon Beckham and Brent Morel have fizzled out, players like Viciedo (23), Chris Sale (23), and Addison Reed (23) have all come through the system and emerged as major contributors to the cause. The White Sox ditched core players like Carlos Quentin and Sergio Santos in the offseason, leading many to believe this would be a rebuilding year. Instead, they lead the AL Central, and have the second-best run differential in the league and the best road record in all of baseball. Carlos Gonzalez: The Rockies have been nearly unwatchable this season against every team except the Astros. Troy Tulowitzki has battled injuries and errors, and is not hitting like Troy Tulowitzki. The pitching’s been awful. Their version of the sausage race has dudes dressed like dental hygiene products huffing and puffing up the baselines. But Carlos Gonzalez? Aside from perpetual sunshine, killer beer choices everywhere you go, a barcade that has NBA Jam and 90,000 other amazing old games, and some of the friendliest people in America, Carlos Gonzalez might be my favorite thing about moving to Denver. The Rockies’ left fielder went deep not once, not twice, but thrice Wednesday, jacking his season line to .323/.391/.629. Sure, it’s Coors Field, but you take what you can get on a team this bad. Brooklyn Cyclones: “Williamsburg Night,” in which bearded fans get special vouchers, and grown men in skinny jeans get to run the bases like giddy 5-year-olds? A+++. That was Derek Holland talking to Richard Durrett of ESPN Dallas about his plans to shave his mustache before Wednesday night’s Rangers-Mariners game. A few hours later, he got pummeled for eight runs in 1 2/3 innings. Against the Mariners. The same Mariners who ranked 22nd in MLB in runs scored heading into the game. where do you go from here? Fake an injury and go on the disabled list until you can grow another mustache? Wear a fake ‘stache for your next start? It might all be futile anyway. One imagines the thousands of tiny stray hairs from Holland’s sink drain regenerating Terminator 2–style and seeking vengeance for their former owner’s treachery. Philadelphia Phillies: How many bullets can the Phillies take before their run of NL East dominance comes to an end? In trying for their sixth-straight division title, the Phils have already gone all season without Ryan Howard and Chase Utley, withstood a .239/.284/.309 season from Jimmy Rollins, absorbed a DL stint from Cliff Lee, and whistled idly as Shane Victorino makes his case for The Unflattering GIF Hall of Fame. There are several teams that have withstood a rash of injuries and bad luck yet still hung around this year, including the Cardinals, Red Sox, and Rays. But the Phillies were more top-heavy than any of those teams, supposedly lacking the strong supporting cast to make up for that much hardship. Yet here they are, two games over .500 and just three games behind the division-leading Nationals. if Howard, Utley, and Halladay come back on schedule, if Rollins can get back to career norms, if Chooch Ruiz keeps hitting like a peak Mel Ott, and if they can eke out one of the two wild-card spots and sneak back into the playoffs, this is still a pitching-loaded team that’ll be a helluva tough out come October. Jamie Moyer: A pitcher getting designated for assignment by the worst run prevention team in the league will get anyone three-downed. But let’s call this a celebration more than a funeral. If Jamie Moyer’s major league career is over, he goes out having overcome a period of intense self-doubt in his 20s, dominated in stretches as a poor man’s Tom Glavine in his 30s, remained effective for much of his 40s, and left the game a few months short of 50. We tip our caps to you, sir.